After the re-release of his disc of the Mozart concertos, this is the second James Ehnes disc I’ve heard in the last few months that has been reincarnated from its previous outing. Originally recorded seventeen years ago, Ehnes’s solo Bach seems rather to have been forgotten, and his modern style of playing pays little heed to recent Baroque orthodoxy, but it deserves to be remembered as a lovely thing in and of itself, and I found it enormously enjoyable. 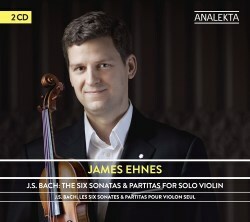 Ehnes plays Bach on a modern violin and in a modern style, but that didn’t bother me in the slightest. There is a smoothness and predominantly lyrical tone to his performances that is, for me, very compelling and very convincing. More importantly, Ehnes is simply being himself. My experience of him in performance is that he is a uniquely responsive artist and has a great empathy for the music he plays. It’s fitting, then, that you know from the opening bars of this disc that this music is being played by a poet. He shows exceptional sensitivity of approach, and has a flexible approach to matters of tempo so that the bar lines dissolve and often, what should be a dance, turns instead into a soulful arioso. Bach’s fugues, miracles of virtuosity all, hold no terrors for him, and the one in the first sonata sounds positively airborne. Even the scurrying Presto that concludes it retains its lyricism. There is great grace in the Allemanda that opens the first partita, even though it's a tiny tad stilted in places. He gives a very logical first Double & Corrente, though he here is rather clinical, almost formulaic. Things only take off at the second Double, but even that involves a bit of note-spinning. However, the second sonata opens with beautiful keening tone (Grave, indeed! ), then a jaunty, dance-like fugue. The subsequent Andante is beautifully played, and there is a cascading feel to the Allegro, as the notes tumble gracefully over one another. Conversely, an air of seriousness settles over the second partita right from the start, almost as though Ehnes is a little bit intimidated by it. This culminates in a performance of the great Ciaccona that is both emotionally moving and impressively architectural. Ehnes shapes it with great seriousness and knowledge of where it is all going. Every grace note and ornamentation is used as part of the architecture, never for mere decoration, and there is an unusual song like strain at the instrument's top, the major key episodes feeling like a repose. Coming after that, the third sonata feels consciously gentle and reflective. The opening rocks beautifully, then runs straight into the second movement like a seamless entity. The third movement is restrained and the finale is spiralling, exciting, uplifting. Then the third partita feels like the most actively dance-like of them all, with a joyous opening, buoyant faster movements, and a real swing of joy throughout. As I said, those who seek Baroque practice should look elsewhere, and you’ll find ample reward from the like of Rachel Podger or Isabelle Faust, but if you want to hear an unashamedly late-twentieth-century approach done very well indeed, then Ehnes is your man. He shows that modern Bach still reaps rewards and that the “authentic” brigade doesn’t necessarily have the whole market to itself.